A couple weeks ago my mom and I took a quilting class together. Seems like such a normal sentence. But for me it was nirvana. My mom’s work situation has changed a bit so that she and my dad now have weekends free (after 10 years!). So getting to spend time with someone I love doing something we love was just so sweet. 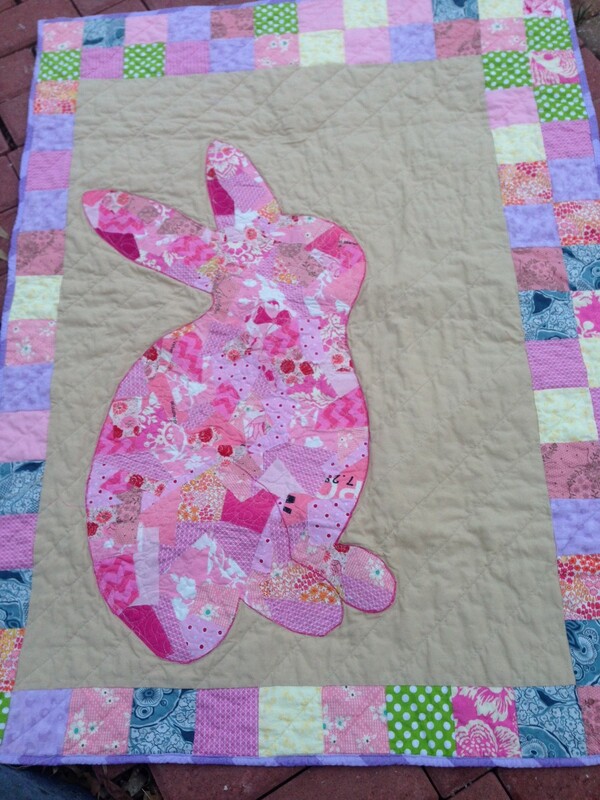 I used the giant pink rabbit to make a baby quilt for a friend. I am meh about the quilt. The rabbit is adorable, but I don’t like the khaki I used behind the rabbit. I was going for that khaki pants-pastel izod shirt look that was the fashion of the cool kids when I was a kid (but not a cool one). Preppy, I guess. But the khaki is too dark and the border is too light. 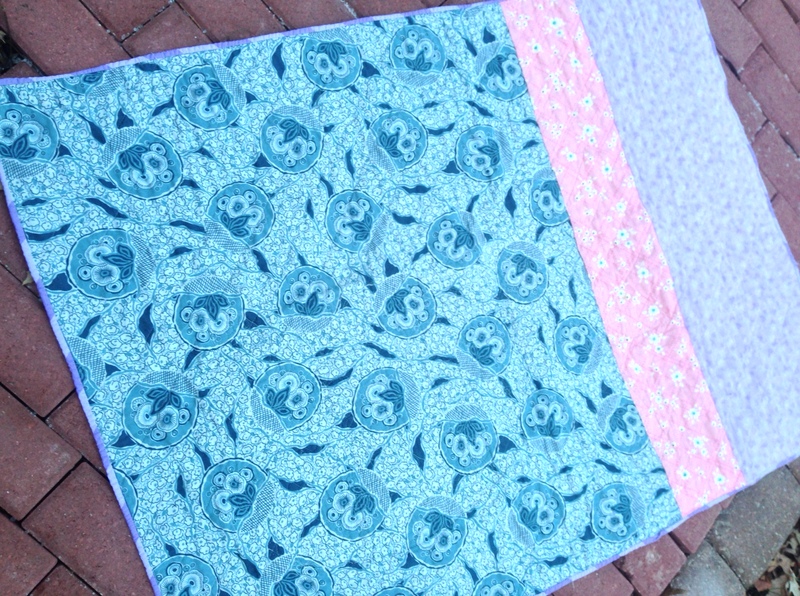 This is the back – using up those large cuts rather than buying fabric. I really do like this technique, but it is a lot of work and the rabbit itself is very stiff. Not sure how to make that better. And I had stress dreams last night about the rabbit popping off because it wasn’t sewn down well enough. And I was very late to work and I was just trying to get the rabbit sewn down. And I had to pee. I always have to pee in my dreams. For better or worse this little quilt is set free today. Hope the little girl it is for will like it. 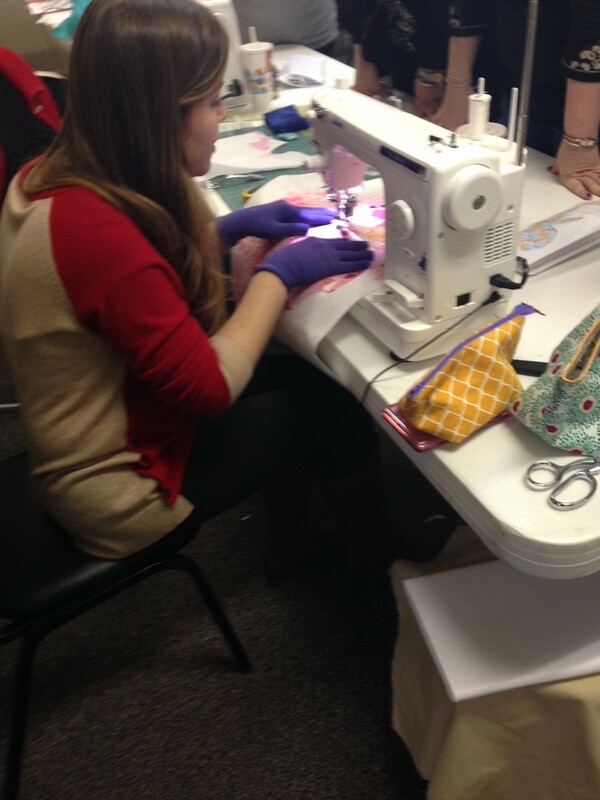 Regardless, I got to spend some time sewing with my mom. woot. Linking up with Amanda Jean for Finish It Friday! OH! That is just too cute!! I love crazy patch piecing. What a great finish!! Oh my gosh – thank you so much. I love the crazy piecing look also. May have to do another one. Darling quilt! I am glad you are enjoying time with your Mama! I miss mine so very much! It’s great to share the same recreational interests!